Elliot Sandy believes everyone at Kettering Town deserved their big moment of celebration at the weekend. 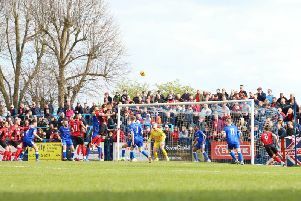 The Poppies completed their home campaign with a 2-1 victory over Bedworth United in front of over 1,000 fans at Latimer Park before they were presented with the Evo-Stik Southern League Division One Central title trophy. The celebrations continued long into the night and Kettering are now preparing to round off a memorable season at Chalfont St Peter on Saturday before they travel to Division One South & West title winners Merthyr Town on May 2 for the final championship match. Sandy grabbed the Poppies’ first goal at the weekend - his 16th since returning to the club at the end of October. And the frontman felt the celebrations that took place after the final whistle at the weekend were fully merited after a job well done over the campaign. “To win it a couple of weeks ago was great and it lifted a big weight off our shoulders,” Sandy said. “We were able to go out and enjoy it at the weekend. “I thought we played really well in the first half and I thought we deserved the win in the end. “I am just delighted for everyone involved in the club and we are going to enjoy it. “We were the favourites before the season started but no matter what league or level you play in, everyone wants to beat you and that makes it difficult. “We battled hard through the winter months and picked up some vital points and that gave us a cushion for the run-in.